The buoy bell was a housewarming gift from M’s family when we bought this little chunk of Vermont all those years ago. Back then, if you remember, the house was up near the road. Far down the slope of a yard stood some ancient apple trees. M took an old hank of rope, threaded it through the top of the bell, looped it over the branch of one tree, knotted the rope. And there she still hangs. Over the years, the tree has grown older and rangy, the house has moved down the slope, the goat fence has arrived (followed by the goats). And there she still hangs. Silent witness until the wind whispers up and shakes everything in its path. The other day there were rumors of snow. We’d been fooled a few days earlier when the blizzard that silenced Boston decided to hug the coast. School was cancelled in anticipation of two feet of snow and nothing happened. The day was cloudy and quiet. Then, in that next wave, the wind came up in long steady strokes and set the bell to ringing and ringing, announcing the coming storm. I could see the wind rustling the high thin branches of the trees, but it was the bell that told me that something worth noting was happening. You’d think we’d be driven mad by the sound of that bell out there, but somehow it’s faded into the background and we have to actively listen to hear it. The way you can stop hearing the train that runs behind your house after awhile. The way you can miss the quarter-hour tolling of the grandfather clock you grew up with. The way, when we first moved here, our land smelled like a pine forest where we’d pitch a tent, and every day seemed like vacation, and now it just smells like home. The way the thing you treasure most seems lost to you, but is all along sitting in the palm of your hand, warm and waiting to be noticed. Beautifully written, and so true. We become lazy and complacent to the beauty of our surroundings, whether it be sound, sight, or a perfumed breeze. 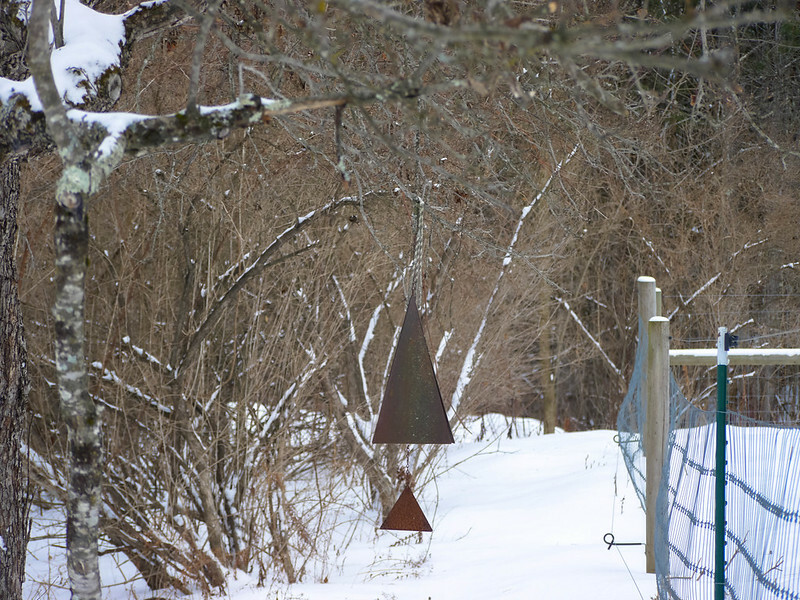 Oh, I love that bell…every farm needs a bell. It keeps one from getting too lonely at times. 🙂 You always have company when you have a bell around. We have that same bell, given to us by friends of my parents for our wedding, which happened three weeks after we moved to New England. It hangs on our porch and whenever I hear it, I think of the ocean. This was lovely to read and listen to!